Several trends in the pet products and services market are helping to fuel its upward trajectory, according to market research firm Packaged Facts. Sales reached $73 billion in 2014, in part due to the trends, which include an uptick in dog and cat owning U.S. households -- especially of small dogs; a rise in e-commerce for pet products, especially pet medications, the aging pet population and an increase in obese pets. The report, U.S. Pet Market Outlook, 2014-2015, indicates that a higher percentage of U.S. households have small dogs (under 25 lbs.) than medium dogs (25-40 lbs.) or large dogs (40+ lbs. ), with the figures at 52%, 32%, and 42%, respectively. The percentage of pet owners with small and large dogs increased slightly, while those with medium dogs held steady. “The shift towards smaller dogs is being driven by the aging population of boomers, who might find smaller dogs easier to manage, as well as the increasing urbanization of Americans, especially among Millennials, who might not have room for larger dogs in their apartments,” says George Puro, an analyst and the author of the report. 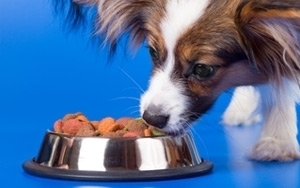 Marketers will be challenged to keep volume sales up, as smaller dogs eat less. However, brands such as Royal Canin and Mars’ Cesar have increasingly specialized their offerings, creating size- and age-specific offerings to capitalize on these trends. The smaller dog shift also denotes opportunities in indoor products, including crates and kennels, training pads, pet beds, and pet odor prevention/removal and clean-up products. Buying products online is another trend that is likely to continue. The purchase of pet products online grew 38% in 2014 and roughly a third of pet owners buy pet products via the Internet. Pet medications sales in particular have been among the most affected by the consumer shift in purchasing pet products online. Because of their small size and low shipping costs, pet medications are particularly well suited for sale via the Internet. The aging pet population is one reason Americans are spending more on pets. Approximately 45% of dog owners have a dog age 7 or older, while 46% of cat owners have a cat in that oldest age bracket, according to the Packaged Facts Pet Owner Survey. The growing population of older pets means more companion animals are suffering from age-related conditions including joint, coronary, cognitive, and immune-system-related, as well as diabetes and cancer. Senior-targeted pet products cover all of these needs as well as routine daily concerns, and because of their more specialized health focus, senior products and services are typically priced well above the market average. “Things that consumers tend to do for their pets as they age is buy things like orthopedic beds, ramps, adjustable height feeders and ‘senior-friendly’ soft chews, such as Ark Naturals' Gray Muzzle line,” Puro says. Much like the increased medical bills associated with aging pets, caring for an obese pet can put a hefty dent in pet owners’ wallets. Data reveals that 52% of dogs and cats in the U.S. are obese. Negative health conditions stemming from overweight/obesity in dogs and cats include osteoarthritis and other orthopedic disorders, type 2 diabetes, respiratory disorders, hypertension (high blood pressure) and cardiovascular disease, non-allergic skin disease, hepatic lipodosis (fatty liver), neoplasia, and many forms of cancer, with a growing body of statistics showing much higher rates of disease in overweight/obese pets. Many pet food manufacturers are capitalizing on the trend with foods and treats directed at obese pets. Hill's Pet Nutrition,asubsidiary of Colgate-Palmolive Co., markets several varieties of weight loss foods for cats and dogs in both prescription and over-the-counter varieties.